Considering how closed off Apple is to the rest of the world, it’s rare to come across a device that works with open source standards as well as Apple’s proprietary standards. The ONCHOICE WiFi Display Dongle does exactly that, however. It supports Miracast and DLNA so you can stream video from any Android device, but it also supports AirPlay so you can stream content from your iPhone or iPad. It’s somehow only $33 on Amazon, and it’s worth every penny.  High Performance: Built-in hot spots, support 2.4G/5G.External antenna provides stable connection. 150mbps transmission. 10M wireless transmit range. 1080P Full HD output to provide the perfect experience.No delay even for playing 3D big screen game. (WiFi signal depends on the environment).  Multi-mode Selecting: It has three working modes:Airplay mirror/DLNA/Miracast.Compatible with Android, IOS, and MAC OS system (not suggest Windows system); Instantly streaming 1080P video, audio, games, pictures from your mobile device to big screen HDTV,Projector and Monitor.Designed for home theater, video games, PPT presentation during meeting and conference. Get one and you don’t need the complicated projector any longer.  Mini design:It is mini and lightweight.Built-in hot spots instead of external WiFi.Very compact.No need for extra WiFi receiver.Plug and play. You can put it in your pocket. Convenient to carry.Ready for important business conference,office routine meeting,multimedia campus education in school,home theater entertainment anytime anywhere. 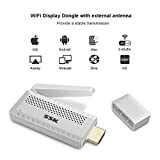  Wide Compatibility: Compatible with many APP,such as YouTube,iTunes,HBO go,Honda Motor, and so on,except Netflix , Amazon Video and Hulu Plus.Our dongle is version 6.0 now.If you are using an iOS device and would like to mirror YouTube, please upgrade the dongle to version 7.0 and ensure you are running iOS version 11.2 or above. Before ordering, please ensure your device supports Miracast (Android) or Airplay (iOS Device).